Fish tagging technologies Where do the fish go? 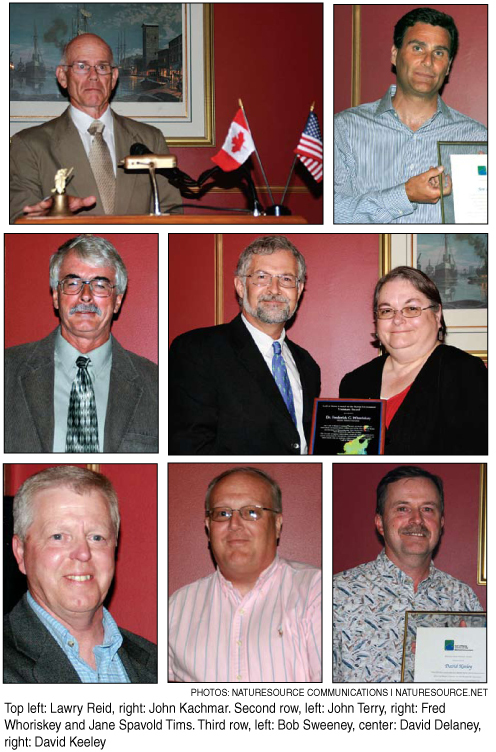 Each year, members of the Gulf of Maine Council on the Marine Environment (GOMC) honor people in the three states and two provinces who have used their talents, energy and commitment to improve the marine environment of the Gulf of Maine. This year, at the June meeting in Salem, Mass., the GOMC presented three special awards, as well as the 10 Visionary Awards to people from Massachusetts, New Hampshire, Maine, New Brunswick and Nova Scotia and 13 Distinguished Service Awards to GOM contractors and consultants Recipients are identified by the positions they held at the time the awards were presented. Bruce Carlisle, assistant director of the Massachusetts Office of Coastal Zone Management (CZM), was awarded the Susan Snow-Cotter Leadership Award, bestowed on one person from the region who shows outstanding leadership or exceptional mentoring in the watershed. Starting as a CZM intern in 1993, Carlisle became coastal nonpoint coordinator in 1997, then director of the Massachusetts Wetlands Restoration Program, which was moved into the coastal program to protect it in a difficult political period. Later, Snow-Cotter appointed him CZM assistant director. Carlisle received the award for his willingness and ability to assume leadership roles, for helping ensure the continuity of the state’s coastal programs, earning the respect of his peers around the country, and for mentoring others along the way. The Longard Volunteer Award is given annually in memory of Art Longard, a founding member of the GOMC and long-time Working Group member to an individual who has shown great commitment to volunteer programs dedicated to environmental protection and sustainability of natural resources. Longard award winner, Lawry Reid of Massachusetts, made significant contributions to the conservation and management of local resources in the watershed by founding the 30-member Straits Pond Watershed Association in 2000 and serving as its president. Straits Pond is a critically impaired 100-acre coastal salt pond in Hull, part of the Weir River Estuary, a state-designated area of critical environmental concern. His association helped establish a $2.5 million culvert reconstruction and tide gate management project to restore critical estuarine fish and invertebrate habitat, provide improvements to intertidal habitat, and improve habitat and forage area for wading and diving birds. The association also conducts education, outreach and coordination, seasonal water quality monitoring, and annual pond clean-ups. The annual Gulf of Maine Visionary Awards are given in each of the five jurisdictions to recognize innovation, creativity, and commitment to marine protection by businesses, environmental organizations, or individuals who are making a difference to the health of the Gulf. Dr. David M. Burdick of the Jackson Estuarine Laboratory: For his efforts in salt marsh restoration, marine and estuarine education, and promotion of the function and services that wetlands and coastal habitats provide. He has freely given time as a volunteer and provided professional services to solving environmental issues, improving environmental quality, and working toward long term sustainability of these systems. Susan Foote, Seabrook Planning Board and Seabrook Conservation Commission: For her tireless work in managing and protecting Seabrook’s critical resources—fresh water wetlands, tidal wetlands, wildlife habitat, and beaches and dunes, as well as her dedication to the preservation and maintenance of conservation lands in connection with the development of commercial, industrial and residential projects. John Terry, Gulf of Maine Institute: For his efforts to inspire youth and adults to act in partnership to support environmental stewardship of the Gulf of Maine through projects which include mapping and controlling invasive species, cleaning up marine debris, supporting habitat restoration of fish, environmental justice, low carbon diets and more. While Terry lives in Maine, his impact is felt throughout the Gulf. Evan Richert: For his extraordinary leadership as director of the Maine State Planning Office for Governor Angus King, as chair of the Gulf of Maine Ocean Observing System, and as director of The Gulf of Maine Area program. Richert is credited with changing the way people think about marine science and ecosystem-based management at the regional and national level, and is recognized as a national leader in advocating sustained funding for ocean observations and research. Sweeney International Management Corporation: For commitment to work with its clients to ensure long-term environmental sustainability, under the leadership of Bob Sweeney. Depending on the client’s particular needs, SIM Corp. provides a full range of professional services to the aquaculture industry by conducting pre-site assessments for finfish aquaculture growers, providing recommendations on the suitability and sustainability of proposed sites, and conducting annual monitoring programs. Bob Sweeney also serves on the Steering Committee for the South West New Brunswick Bay of Fundy Marine Resource Planning Initiative. Dr. Frederick G. Whoriskey, Atlantic Salmon Federation: For the development of improved sonic tracking systems—in cooperation with an engineering firm, Vemco Ltd, Halifax—to follow the movements of Atlantic salmon in rivers and the ocean. The worldwide leading-edge technology has tracked smolt more than 1000 km (621 miles) at sea, and tracked salmon for several months after their release from sea cages in Cobscook Bay into the Gulf of Maine. He has spoken on his work to meetings of ICES (International Council for the Exploration of the Seas) and many other organizations and universities. Dr. Whoriskey also directs field courses for McGill University students. David G. Delaney: For mixing research and outreach in creative and innovative ways. Delaney works to increase public awareness of environmental problems. He brings inner city youth to marine environments to conduct hands-on learning as part of his international research program. As director of the Invasive Tracers, which brings together biologists and volunteers to monitor GOM areas for native and invasive species, for the last three years Delaney has recruited and supervised approximately 1000 people to monitor more than 60 sites from New Jersey to Canada. Edward Thomas, Esquire: For his extensive pro bono public assistance to the Massachusetts Office of Coastal Zone Management StormSmarts Coast Program. His dedication and expertise has significantly bolstered the program’s ability to promote coastal community resiliency through the No Adverse Impact Approach. His enthusiasm is exceeded only by his commitment to the preservation and protection of the coastal residents, businesses, and environmental resources of the area. Dr. Tony Charles, Saint Mary’s University: For his teaching and research on interdisciplinary aspects of natural resource management, notably in fisheries, aquaculture and coastal management. Dr. Charles coordinates the university’s Fisheries and Coastal Seminar Series, is involved in a wide range of community service and has been extensively published. For much of the 1990s, he served on Canada’s Fisheries Resource Conservation Council, and currently is national director of the Ocean Management Research Network. 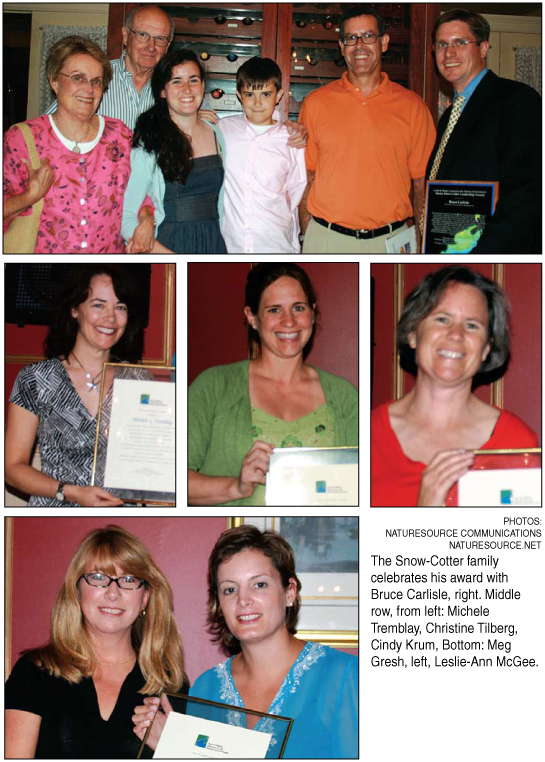 Union of Nova Scotia Municipalities: For demonstrating leadership and commitment to sustainability by establishing a Municipal Sustainability Office in January 2007. The office helps municipalities in Nova Scotia become more sustainable by facilitating the sharing of information and expertise on environmental best practices. An online sustainability guide provides the 55 municipalities with timely and practical information on energy efficiency, renewable energy, adaptation to climate change and environmental sustainability as it relates to municipal governments and communities. Distinguished Service Awards are given by the GOMC to recognize the dedication and commitment of its contractors, consultants, or anyone involved with the organization, who are instrumental in protecting the Gulf’s resources. This year, a special Distinguished Service Award honored Patricia Rae Hinch, of the Nova Scotia Department of Environment and Labour, who has served tirelessly as a Working Group member, including several years as chair, since nearly the council’s inception. The Distinguished Service Awards were presented to: Jim Cradock, systems administrator, data architect and programmer; Sara Ellis, GOMMI coordinator; Meg Gresh, administrative assistant; Lori Hallett, finance assistant; Karin Hansen, outreach committee education and marketing coordinator; Steve Jones, Gulfwatch coordinator; Jon Kachmar, habitat restoration partnership coordinator; David Keeley, policy and development coordinator; Cynthia Krum, executive director, US Gulf of Maine Association; Peter Taylor, science translator and web producer; Christine Tilberg, ESIP program manager; Michele L. Tremblay, council coordinator and Lori Valigra, editor, Gulf of Maine Times.